What exactly does the y-axis "Height" mean? Looking at North Carolina and California (rather on the left). Is California "closer" to North Carolina than Arizona? Can I make this interpretation? Hawaii (right) joins the cluster rather late. I can see this as it is "higher" than other states. 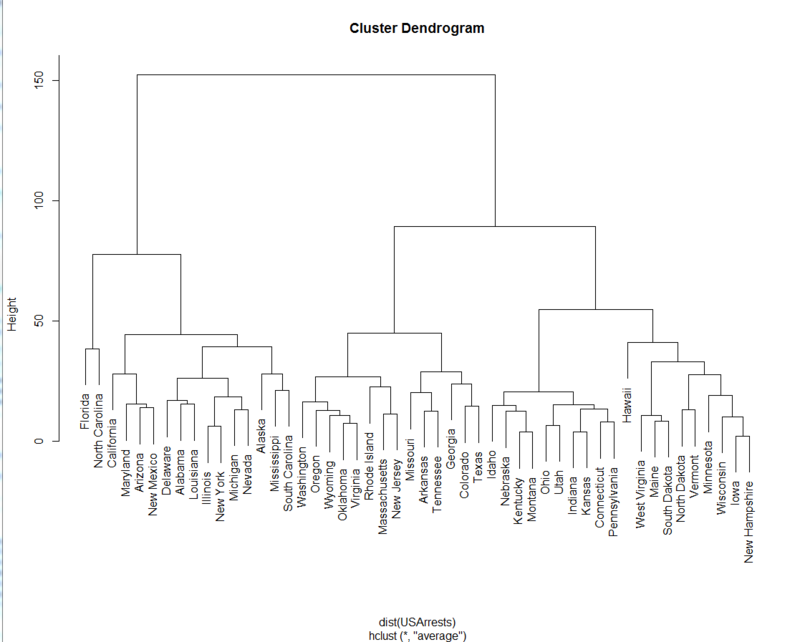 In general how can I interpret the fact that labels are "higher" or "lower" in the dendrogram correctly? 1) The y-axis is a measure of closeness of either individual data points or clusters. 2) California and Arizona are equally distant from Florida because CA and AZ are in a cluster before either joins FL. 3) Hawaii does join rather late; at about 50. This means that the cluster it joins is closer together before HI joins. But not much closer. Note that the cluster it joins (the one all the way on the right) only forms at about 45. The fact that HI joins a cluster later than any other state simply means that (using whatever metric you selected) HI is not that close to any particular state. I had the same questions when I tried learning hierarchical clustering and I found the following pdf to be very very useful. Even if Richard is already clear about the procedure, others who browse through the question can probably use the pdf, its very simple and clear esp for those who do not have enough maths background. The horizontal axis represents the clusters. The vertical scale on the dendrogram represent the distance or dissimilarity. Each joining (fusion) of two clusters is represented on the diagram by the splitting of a vertical line into two vertical lines. The vertical position of the split, shown by a short bar gives the distance (dissimilarity) between the two clusters. Not the answer you're looking for? Browse other questions tagged interpretation hierarchical-clustering dendrogram or ask your own question. How can I order kmeans clusters? Would anyone be able to help me interpret the dendrogram in the picture?